I didn’t post this last month because I didn’t want two cat-related posts in the same month. That would be too excessive. The doors on my car are wrong. Rather than opening like a normal car some bright spark decided that electric doors, that open like a vehicle from a science fiction series, were a good idea. They’re not, because there are so many problems involved with them. 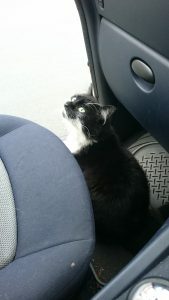 I sat, mostly motionless, as the cat proceeded to hop into the footwell of the passenger side, then into the back seat, then back to the door again. 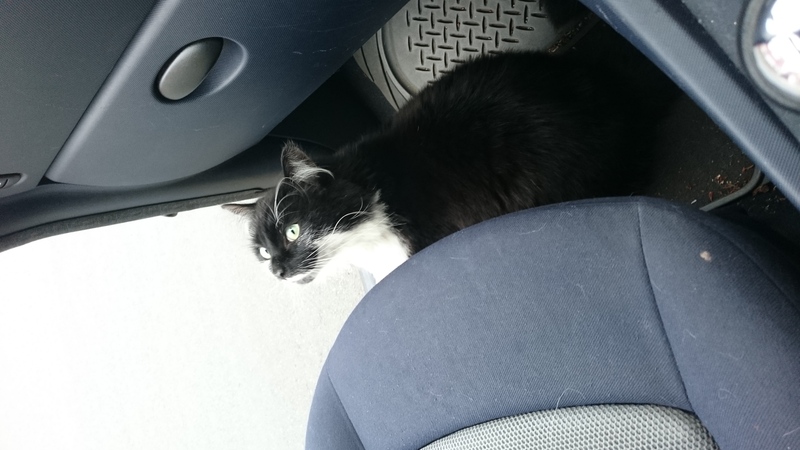 It sniffed most of the interior, more than I have managed to sniff myself, before looking both ways and disappearing as quickly as it had appeared. Very strange. Not as strange as coming across an owl in a coffee shop yet still unusual for a Sunday afternoon. I approve of everything about this. The world needs more of this. My only question is this: why have you not sniffed more of the interior of your car? You’ve owned it long enough. Why have you been wasting so much time? I cannot answer that question without feeling the shame of knowing that I could have and yet have not done so. So I will, and the shame comes across me like a coat made of rich tea biscuits: harsh, coarse, beguiling. Enough stalling. Get sniffing, and present us with the results, pronto. Well, that’s a turn up for the books. Was it Danny Baker’s car before you got it? I’ve heard he demands all doors in his life to be electric, including all his kitchen cupboards. I did wonder, so I left a dash cam in the car one evening to see what was going on. As it happens, Danny Baker broke in and rubbed himself all over the interiors. The next night a Danny Baker look-a-like did the same thing. Then someone called Banny Daker turned up and I had to call the police. That’s outrageous. Presumably the Danny Baker look-a-like was also a Danny Baker smell-a-like or else their rubbing wouldn’t have had the same effect. The Danny Baker look-a-like smelled so convincingly of Danny Baker that I thought it was Danny Baker back for a second pop. I take it your dash cam is one of these fancy new ones that record in-car smells as well as pictures. That’s pretty nifty. Oh yes, it IS, isn’t it?